This challenging mind bender puzzle is great fun to do over coffee, with friends, or on the toilet…alone. Imagine you are working as a cashier at a liquor store, late in the evening, the night after St. Patrick’s Day. Note: all California Super Lotto transactions are not entered in the cash register, but they must be paid for and so entered in the debit/credit machine only; lotto cannot be played on “credit” and there is a 50-cent “debit” fee. A spaced out, gray haired, lady gambler saunters into the liquor store, and hands you a fistful of “winning” lotto tickets, so you run them through the lotto machine to discover the winnings, which include: $15 cash award and 4 replays. You hand the replays back to the spaced-out lady gambler, and there is no balance difference. She then hands you 2 playing boards, with her hand-drawn penciled-in numbers, and the total owed is $120. If the previously mentioned winnings are deducted as cash tendered, what is the current total she owes? While deciding on her next automatic “quick pick” wager, she pries off the lid, “how much are these?” and plucks 5 red licorice sticks out of the plastic bin, priced at 10-cents each. She stuffs all five of them into her mouth, bending them in half, while “ummm-ing” and gumming and deciding what tickets to buy. How many quarters does she push onto the counter for 5 red licorice sticks? The spaced-out lady gambler decides to wager an automatic “quick pick” of 4 lines (priced at $2 per line) of Power Ball for both Wednesday and for Saturday, which means 4 lines at $2 per line must be accounted for twice. Temporarily disregarding the quarters on the glass counter for the swallowed licorice, how much does she owe in total now? 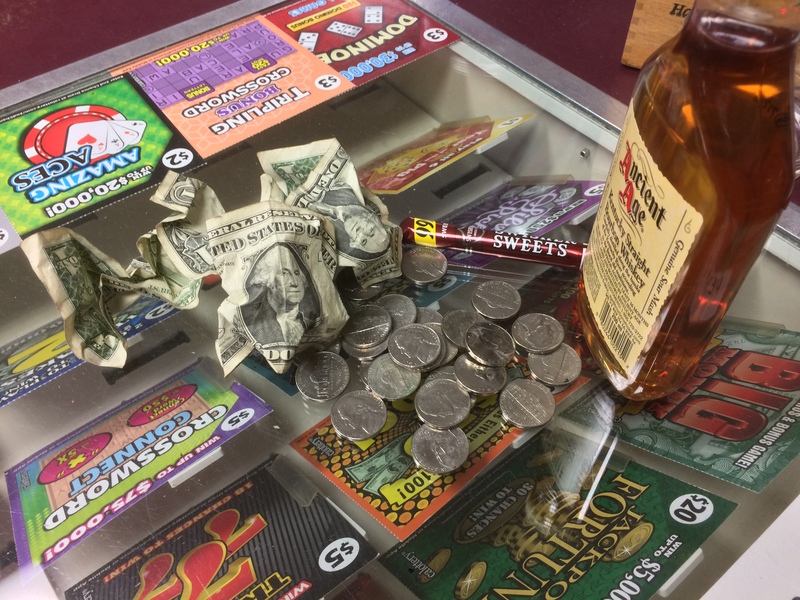 With the above “Sweet Cash” lotto scratchers entered into the cash register and their associated winnings entered as cash tendered; the 5 red licorice sticks and their associated quarters entered as cash tendered, and finally the debit fee, how much does she owe according to the register? As you finish squaring up the “Sweet Cash,” the quarters for licorice, and the debit fee, the debit/credit machine is beeping incessantly (beep-beep-beep-beep) because the spaced out gambler shoved the card into the machine before you knew what to charge. Do you leave the card in the machine while it beeps loudly, or do you ask her to remove the card so you can concentrate to calculate the final total? Finally, of utmost importance: add the amount owed after the “quick pick” Power Ball wager to the final amount also owed according to the cash register. Including all the California Super Lotto wagers (hand-drawn and “quick pick”) that were not entered in the register, and the balance owed on the register, how much money does the spaced-out gambler owe in total that you enter in the debit/credit machine? ‹ PreviousThinking about Yangon: Normalcy or Conflict?